The use of X-ray techniques to inspect the integrity of industrial products dates back to the turn of the century. Therefore, there is nothing new about the use of X-rays to carry out inspection of castings. What is new, is the technology improvements associated with the creation of the X-ray image and the modern computer hardware and software improvements that allow the X-ray inspection process to be carried out at high speed and in a true fully automatic mode. 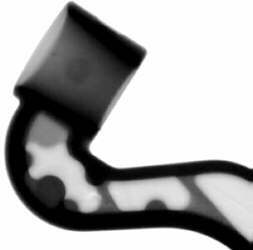 This article discusses the fundamentals of X-ray imaging, recent changes in the X-ray techniques and automating the X-ray inspection process so the end user benefits from improved quality and reduced operating costs. A fully automatic X-ray inspection system is shown in figure 1. Let us first dispense with the plethora of jargon that surrounds the name "X-ray Inspection". The process is sometimes referred to as, fluoroscopy or real time or sometimes radioscopy. They all refer to the same inspection process. The purest in the X-ray business with some justification would say radioscopy is the correct name. However, this term is not generally used in the casting industry. Therefore, in the interest of clarity, the inspection process in this article will be referred to as "X-ray inspection". A collimated beam of ionizing radiation emitted from a X-ray tube passes through the casting being inspected. After the beam passes through the casting, it impinges on to the imaging device, which would be either an image intensifier or a digital imager. The imaging devices are discussed in the next section, headed "X-ray Inspection Techniques". As the beam passes through the casting the X-ray energy level is attenuated in proportion to the material thickness and the presence of any void, inclusion or discontinuity within the casting. In effect, an image similar to a shadowgraph is produced but with added information relating to the internal structure of the casting. This is illustrated in figure 2. The presence of a void such as porosity would reduce the amount of attenuation at the location of the void. This attenuation reduction has a direct relationship to the X-ray energy attenuation of the sound material immediately adjacent the void. Conversely, if a high-density inclusion is present within the casting the level of attenuation would be increased. The imaging device records the X-ray energy level impinging on the input face and from this information a two-dimensional X-ray image is produced. Focal spot size of the X-ray tube head. Geometric distances between the tube head and the imaging device and the casting and the imaging device. X-ray energy level to be utilized, i.e. kV. and mA. The physical size of the focal spot (the area within the X-ray tube head that emits the X-ray beam) is a very important factor in determining resolution of the image. As illustrated in Fig 3a, if the focal spot size is too large the penumbral effect will create an un-sharp image and reduce the resolution capability. A more appropriate focal spot size is illustrated in Fig 3b. In this case the area of un-sharpness is small and as a consequence a sharp high-resolution image would be produced. However, it does not follow that the smaller the focal spot the better the over-all image quality. This is because the X-ray image quality is dependent on a combination of both resolution and contrast characteristics. One factor that effects contrast of the X-ray image, is the photon flux density of the X-ray beam, which is mainly dependent on the mA level. The smaller the focal spot size the less photon flux can be produced. Therefore, the optimum image quality is produced by a balanced approach between focal spot size and the amount of mA utilized. This is particularly important when inspecting light alloy castings. For light alloy castings the use of a tube head that has a variable focal spot can be an advantage. The tube head would need the capability of varying the focal spot from 70um to 300um. As it can be seen from Figs 3a and 3b, geometric distance has an effect on image resolution. There is no one rule to determine geometric parameters, as practical aspects associated with the physical size of the casting have to be taken into account. The "rule of thumb" would be to put the casting as close to the imaging device as possible but take into account the field of view that would be obtained. Again, there is no one rule for the settings of kV and mA parameters. The "rule of thumb" would be to set the kV at a level that is sufficient to penetrate the casting and then maximize the available mA. It can be concluded from the above comments, that determining the optimum technique requires a high level of skill, in-depth knowledge of the equipment to be used and sound knowledge of the castings being inspected. A high quality X-ray image of a light alloy casting is shown in Fig 4. This image was produced using an amorphous silicon flat panel digital imaging device. The evolution of the X-ray inspection technique, as used in the casting industry, as gone from producing an image using a crude low light, noisy phosphor screen that fluoresces when bombarded with ionizing radiation, to a high resolution clean image generated using digital imaging devices. During this evolution, the most widely used technique, utilized the X-ray image intensifier coupled to a CCD camera. The image intensifier is a large cumbersome device weighing approximately 80 lbs. and is manufactured using evacuated glass technology. In basic terms, the image intensifier captures a low light image on a coated fluorescent input screen, converts the light energy to electron energy and then accelerates the electron energy across an evacuation chamber to a smaller output fluorescent screen. The acceleration of the electrons substantially increases the brightness of the image. It is then converted back to light energy and picked up using a CCD camera. The image is then displayed on a high-resolution monitor. The main advantage of the image intensifier is that it produces a live real time representation as the image is generated at a video frame rate of 30 per second. As a consequence, the image is constantly being refreshed and the operator can view the live image while the casting under inspection is being manipulated. The limited dynamic range necessitates that castings with varying thickness within the area to be inspected need to be inspected using more than one technique. For example, the thinner sections of the casting would require a lower energy level (kV) to produce the image than the thicker areas. In addition, the introduction of X-ray beam filtration may be required to overcome the deficiency. The net result is that the inspection technique is complex and the time to satisfactorily carry the inspection is increased if multi X-ray techniques are required. The input screen of the image intensifier has a physical size of nine or twelve inch diameter. You will note from fig 2, the actual image of the casting is magnified, approximately 2X. This means that only a three to five inch diameter area is being inspected at one time. Consequently more images are required to obtain full volumetric coverage, resulting in a further increase in inspection time. This is not so important when the image is being viewed manually but very important if the operation is fully automatic. Due to the limited dynamic range, the edge of the casting is difficult to inspect with a high degree of confidence without the use of accurate masking of the casting or filtering of the X-ray beam. This is because the ionizing radiation passing by the edge of the casting is not attenuated and as a consequence bombards the input phosphor at a substantially higher level than the ionizing radiation passing though the casting. This can have the effect of bleeding out the image at the edge of the casting. Addressing this problem is particularly important when inspecting high-density castings. The image produced by the image intensifier is relatively noisy. The use of a good X-ray technique can reduce this phenomenon, i.e. the careful use of X-ray beam filters and limiting devices. However, to produce a clean noise-free image it is necessary to digitally process the image, e.g. video frame averaging. As this type of image processing requires time to implement, the casting needs to be still when the image is captured. Consequently the benefit of a having a real time image is lost. As it is essential to have a clean, noise-free image for automatic inspection, the time taken to computer analyze the image is increased and as a consequence increases inspection time. The use of direct digital imaging devices in the main overcomes the above mentioned problems. This is particularly evident when the operation is in the fully automatic mode. In addition, the digital imaging devices offer a larger inspection area, a substantial improvement in contrast capability, in some cases an improvement in resolution and is lighter and more robust in construction. The digital imaging devices are two fundamental designs. One type is based on a flat panel amorphous silicon (a-Si) or amorphous selenium (a-Se) sensor array. The active imaging area of the panels varies from 4x4 inches to 18x20 inches. The physical size ranges from approximately 6x6 to 24x24 inches with a thickness of approximately 2inches. The maximum weight is 15 lbs. The arrays are produced using thin-film transistor technology and the pixel pitch varies from 123 to 400 microns. All these devices are directly interfaced to a PC and the digital image is displayed on the computer screen or a video work station. The other design is based on a linear diode array (LDA). This device consists of a single row of imaging elements as opposed to the area array of the a-Si or a-Se. On the input side of the LDA is a scintillation screen or a series of scintillating elements coupled to a linear array of diodes. The pitch between the diodes can vary but for the X-ray inspection of castings the pitch would be in the order on 0.25 mm. The element pitch is the main parameter that determines the resolution capability of the LDA. The width is in the order of 2 inches and the length theoretically can be as long as required. However, the normal length would be up to 24 inches. The weight of the LDA is only 4 to 8 lbs. With an LDA the image is generated by passing the casting by the LDA or the LDA by the casting synchronous with the X-ray tube head. At given time intervals a line image is captured and then compiled into a composite image of the area that has been scanned. This is illustrated in Fig 5. The demand for light alloy castings for the automotive industry has increased dramatically over the past five years. 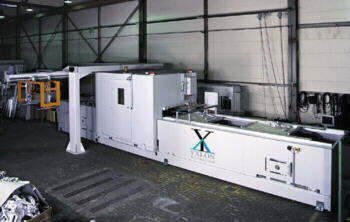 This in turn has increased the use of X-ray inspection in the major casting facilities throughout the world. In addition, the automotive industry is striving to manufacture lighter automobiles. This requirement makes it important to reduce the weight of the castings without compromising the structural integrity. To meet the market demands, major casting companies have installed fully automatic X-ray inspection systems to carry out 100% inspection to ensure structural quality standards are met. Meet or exceed Level 2 equivalent as stated in ASTM E155. The X-ray systems would need the capability to inspect a wide range of products such as suspension knuckles, cross members, transmission housings and automotive wheels. In some cases the system would be designed to handle limited types of castings and in other situation a variety of castings would need to be inspected by the same system. Weight would range from 4 to 70 lbs. per casting and material thickness from 0.125 to 2.5 inches. Castings up to 25 Ibs would need an inspection cycle time of 10 to 20 seconds per casting. Larger castings must be inspected in less than 40 seconds per casting. These inspection speeds assume 100% volumetric coverage is required. If less coverage of the casting is required, then the inspection speed can be increased. Complete operation to be fully automatic including parts handling, accept and reject sorting, parts manipulation, X-ray image analysis and tabulation of inspection results. False accept rate to be zero and false reject rate to be less than 3%. Casting floor operation to be carried out by machine operating staff. The calibration and programming of the system to be carried out by trained X-ray technicians. Training of the operational and technical staff to be carried out by the system manufacturer. Up time to be better than 95%. Feed back capability, so inspection results can be fed to the quality department and be used for process control purposes. 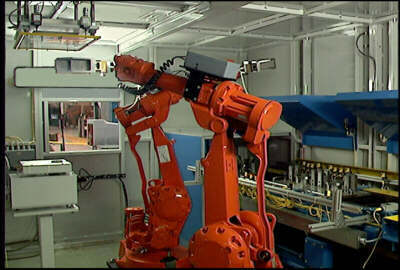 Fig 6: Fully automatic X-ray system, Model MU59, using two anthropogenic type robots providing a high level of dexterity. More reliable and consistent X-ray inspection results. Reduction of the time taken to carry out X-ray inspection. Reduction of labor cost to carry out X-ray inspection. As the X-ray inspection results are produced and tabulated immediately after then inspection has occurred, the results can be used as a process control tool. The most significant factor is that X-ray inspection is now an integral part of the process control procedures within the casting operation. The feedback from the casting industry is that scrap rates can be reduced from 5% too as much as 50%. If the following example were taken, the cost savings on the reduced scrap rate alone would be $362,880. Number of castings inspected by a fully automatic system per day is 4000 i.e. 1,344.000 per year. Scrap reduction due to fully automatic inspection is 6% of castings inspected i.e. 80,640 castings. Cost savings per casting are $4.50. Cost savings per year due to the reduction in scrap rate are $362,880. In addition to the savings on reducing the scrap rate, the savings that relate to labor costs is taken into account, a return on investment (ROI) can be realized in a 12 to 24 month time frame. Therefore, the use of fully automatic X-ray inspection can improve quality and at the same time reduce costs.